NPR’s “St. Louis on the Air” appearance on Monday. A cedar waxwing shows off its dollops of red and yellow. 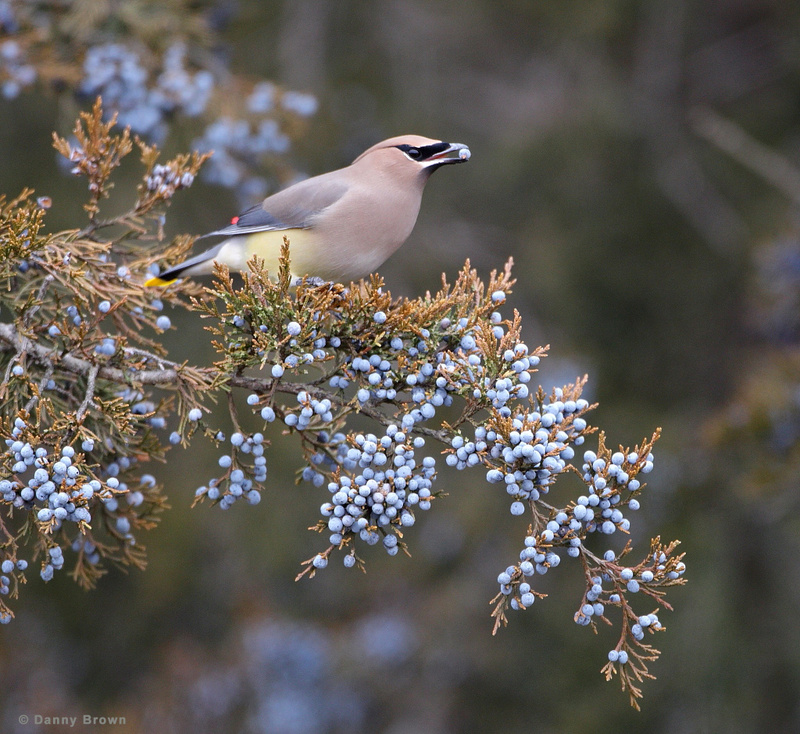 The holidays brought a lot of family, friends, and food to the farm but they also brought cedar waxwings, which have been gorging on cedar cones every day. As you can see from the featured image, we are not lacking for the little blue cones that the birds love so much. 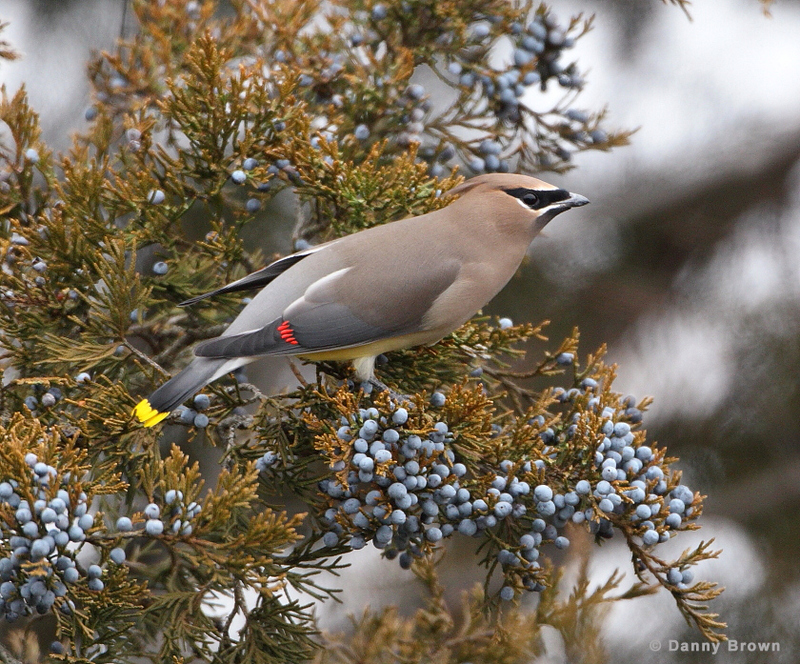 We’ve also had bluebirds, robins, butterbutts, hermit thrushes, and others but this photo essay is just for the waxwings. 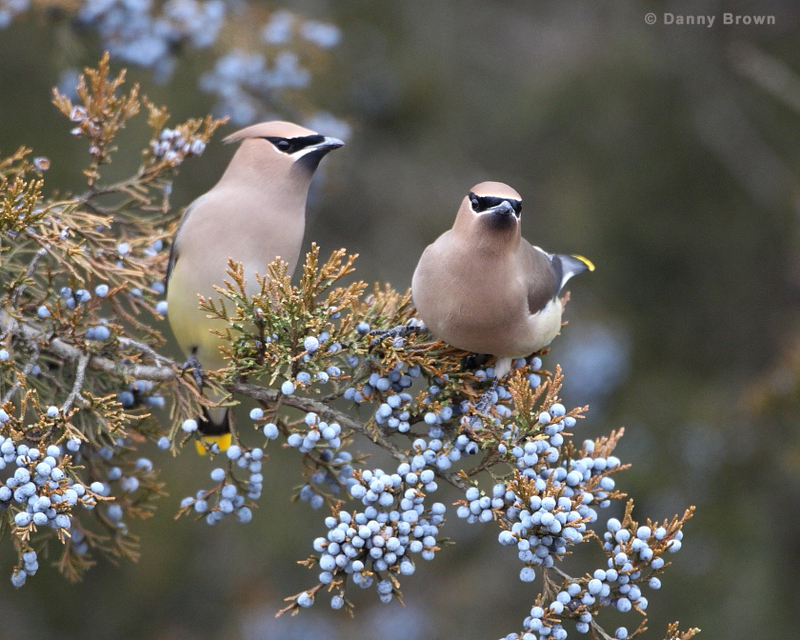 A rare moment when two waxwings choose the same cluster of berries, aka cedar cones. The cones are as colorful as the birds. The moment before the bitter, blue berry goes down the hatch. Cedar cones are used to make gin. 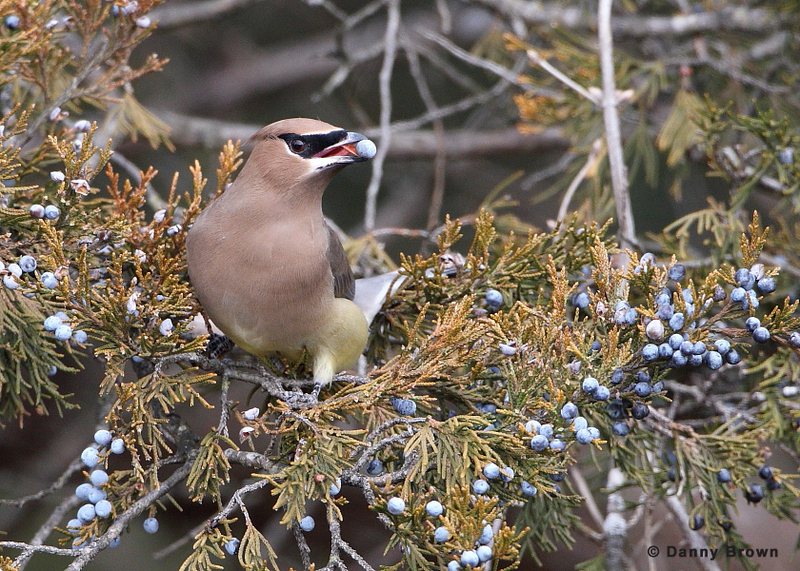 Cedar waxwings eat cedar berries like teenagers eat M&M’s and it seems like they are never full. A nice vertical of one of our beautiful visitors. Probably the sharpest image of the day. 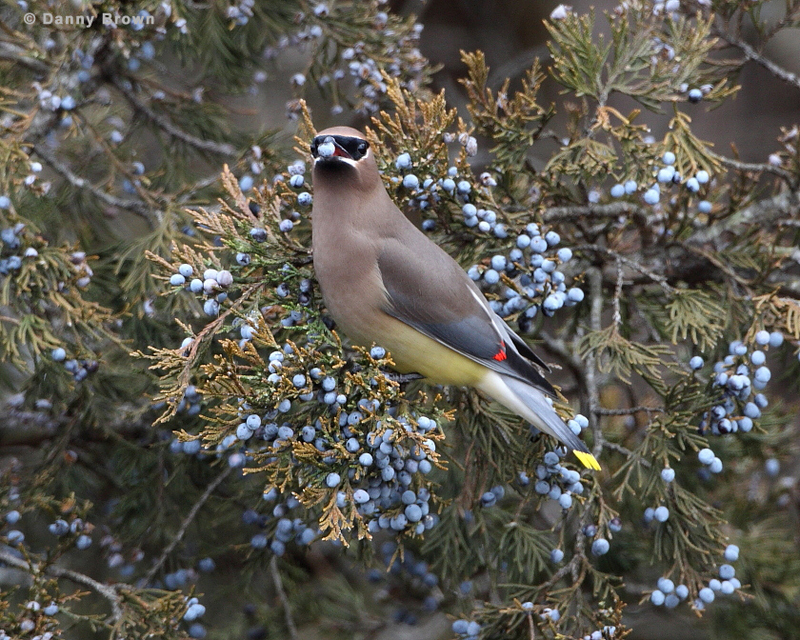 Cedar waxwings give cameras fits because they lack contrast around their eyes, right where it is needed for sharp focusing. Their oh-so-smooth feathers are also problematic for focusing systems because they produce such a uniform surface. You might as well be photographing a blank wall. Every time I photograph waxwings I start wondering if my camera is out of adjustment because my keeper rate is so low, at 15% or less. 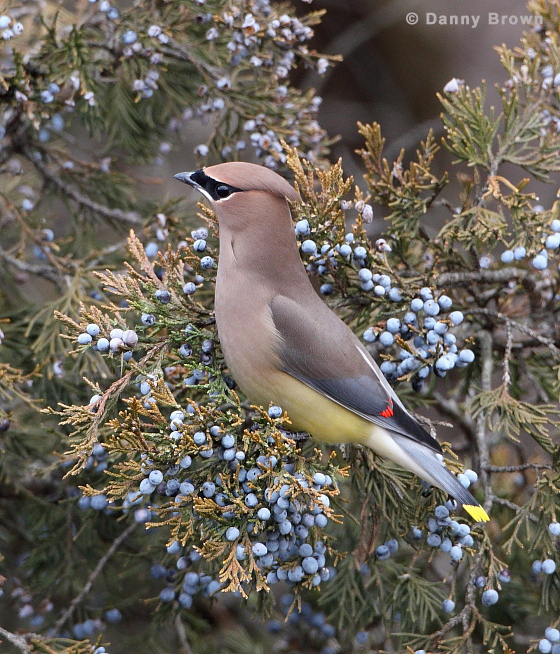 Maybe later I’ll share some images of the other birds that have come to visit our cedar trees. They sure added some extra joy to the holidays for us. Now I better get back upstairs to see if I can help Joyce with one last holiday dinner for family and friends. I suspect I’ll just get in her way. Well, Christmas is now past,but I think I can wish you and Joyce happiness and health for the New Year. I hope the Waxwings brgin, I mean bring, you luck! Danny, these are beauties….love the color, clarity, and setting. I keep looking for waxwings, but seldom see them. Thanks for sharing….Phil J. We get them pretty frequently here at the farm. Such a great article. One of the birds I really enjoy seeing as they migrate through the area. Well done Danny and I appreciate the tips shared. Great to hear from you, Miguel. I like the template of your blog. I might have to change mine. It is due after all these years. Always. Glad you like it. Change is good.